Okay, we admit it. We had no plans to publish a list of the best public golf courses in America until closer to summer. Much of the country is still wearing coats to go check the mail. A winter storm just passed through the inter-mountain west. It was so fierce that the Atlanta Braves AND the Colorado Rockies (who should be used to such a thing) fled to the airport to get out of Denver. So, it’s too early for a golf course article. Except it isn’t, because of Tiger Woods. Two decades after his first win at The Masters, Woods’ circuitous comeback to glory seems to be a reality. He was the best before he broke down in front of us all. Now he is a Masters champion again. So, let’s talk golf! Because, after Tiger Woods’ performance, golf is on your mind and won’t leave. Here are the seven best public golf courses in the country, according to Gildshire Sports. Opinions and priorities vary with individual golfers, so we didn’t put them in a 1-10 order. Except for the last one, that is. Because it is the best. TPC Sawgrass, Ponte Vedra Beach, Florida. The TPC courses are uniquely designed as a stadium concept for the benefit of spectators. Instead of hiking miles to see several courses, onlookers can stay put and see the action at several holes, all at once. However, the uniqueness of TPC Sawgrass isn’t in its stadium concept. It’s that diabolical island green that the players must hit while dealing with the winds off of the Atlantic! Every golfer should square up against that island at least once. Erin Hill Golf Course, Erin, Wisconsin. You may have heard that Erin Hills was founded to host a U.S. Open. That wasn’t true, though the golf course founders approached the PGA shortly after it was built. Truth told the course was designed to celebrate Mother Nature and her way of turning terrain into golf courses. The 7,812-yard par 72 course sways and undulates with its surroundings in an almost hypnotic way. Bethpage Black, Farmingdale, New York. Bethpage Black was once known for its parking lot as much for its course. You see, the course was popular, but it was first-come-first-served. So, scores of cars would line up in the lot and golfers would sleep overnight, in hopes of getting a coveted tee time. Think of it as Hooverville in plaid slacks. Now, you can reserve a tee time online. Check your ego, though. Bethpage Black is hard to play to a low score! Pinehurst Resort Number Two, Pinehurst, North Carolina. Nine years ago, Pinehurst #2 went under the knife and was transformed. Gone was the Bermuda grass rough that dated to the 1970s. Instead, the course designers put in bands of hardpan sand (native to the local area) and dotted the course with wire grass and pine needles. They reduced irrigation to prevent non-native grass from returning, and in doing so, gathered rewards for water savings and environmental fair play. Shadow Creek, Las Vegas, Nevada. Back in the day, Shadow Creek began life as an exclusively private course. In fact, it was The Best New Private Course of 1990, as rated by Golf Digest. Since going public, though, changes have been made to the layout, to the point that it is described now as “a symphony.” What do we mean by that? Its holes alternate difficulty rating, and between wooded, and open range. Some say it should be on every golfer’s Bucket List and Gildshire cannot disagree. As the fog rolls in, Pacific Dunes resembles no other golf course. Pebble Beach Golf Links, Pebble Beach, California. Pebble! One word says it all for golfers of all ages and all skill sets. It is the crown jewel of the Monterey Peninsula and Mecca for the golfing hordes that live out their dream here. It’s called the most profound meeting of sea and land in American golf, and is the most extensive one, as well. Nine holes perch overlooking the crashing Pacific surf. Heck, holes 4-10 never leave the shore and 17-18 come back for more. 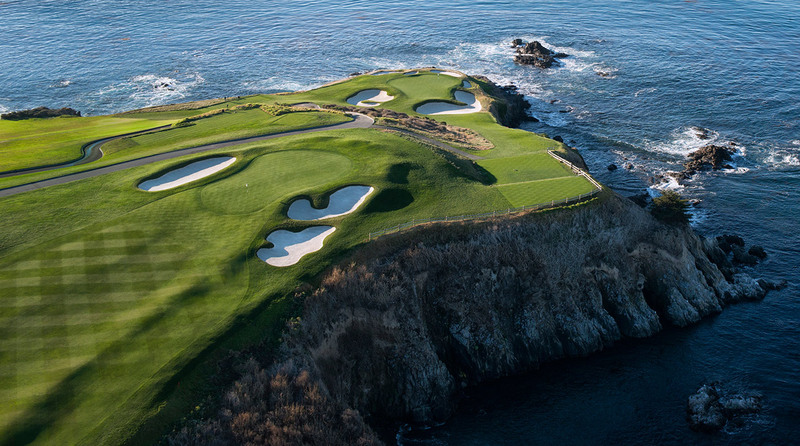 Pebble Beach’s holes 6-8 overlook the sea AND test the mettle of any golfer. Pebble will host its sixth U.S. Open this summer.